Twice this week I ate at a restaurant with an Augusta address. Two days in a row actually. That wasn’t by accident. I said in my last blog post on the Canal Street Cafe that there are several restaurants in the Augusta area that I wanted to get to. 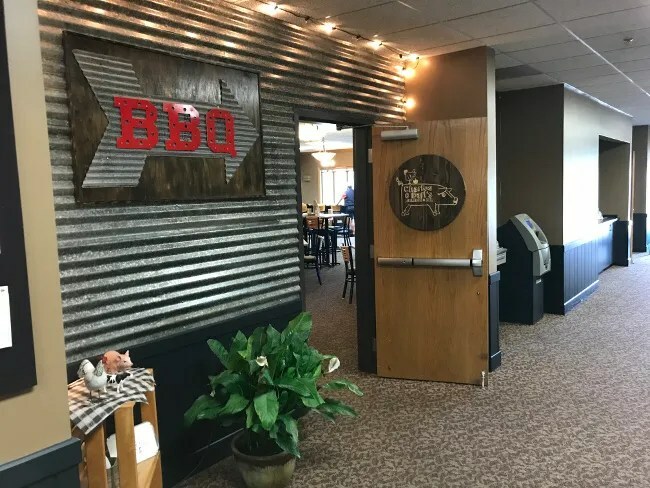 One of those restaurants is a BBQ place next to the Gull Lake View Golf Club and Resort in Ross Township northwest of Augusta proper. It’s a place that I’ve heard a lot about from a lot of different people. 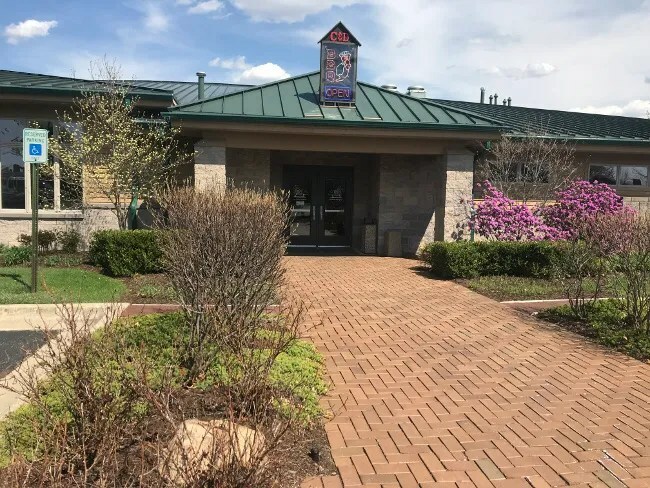 We were out that way a few weeks ago when we went to the Kellogg Bird Sanctuary but we had just eaten lunch at Latitude 42 and we were just too full to stop for dinner. 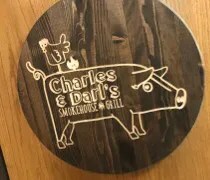 That BBQ joint is Charles and Darl’s Smokehouse and Grill. 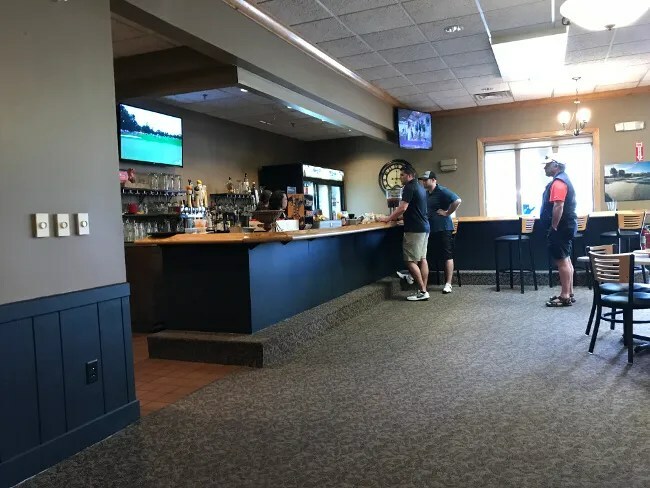 The restaurant is in the clubhouse for the Gull Lake View East Course on the corner of N. 38th Street and M-89. The clubhouse sits at the halfway point right between the 9th and 10th holes on the course. The restaurant has it’s own parking lot and entrance on the 38th Street side of the building. The clubhouse is set up like most golf course club houses. 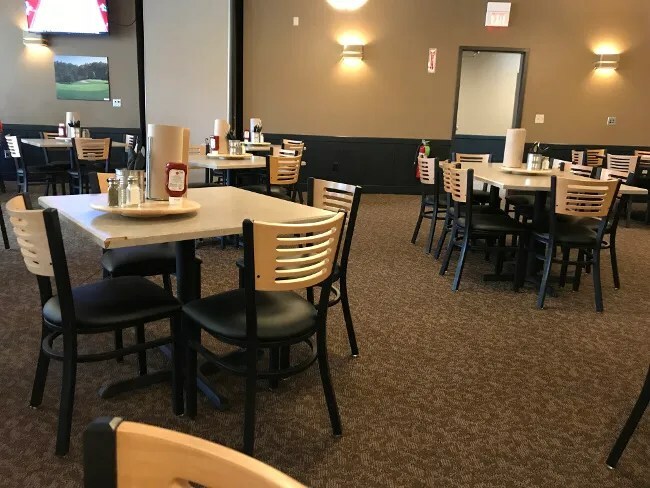 There are several rooms that can be used to host events, wedding receptions, or, in this case, a restaurant. A large tin sign points you in the right direction. The room will immediately remind you of a wedding reception. They added tables and chairs to make this more of a restaurant than a reception space but the space if very generic. With neutral wall and carpet colors and very little in the way of decorations on the wall other than a few TV’s and some golf photos. The bar is near the door that leads to the course. As I mentioned earlier, this is a good stopping point for golfers to come in and grab a few beers and a snack. There were several foursomes that came in to stock up. There are few barstools at the bar as most of the business here is done as walk-up. There was only one other table when we stopped in around 3:00 after an afternoon at Binder Park Zoo. We were a little early for dinner but we hadn’t really eaten much since breakfast. On our days out, we make lunch and dinner kind of a one meal thing. We snacked at the zoo and got dinner on the way home. A waitress came over right away with menus and asked about drinks. I passed on the beer and went with a Coke. J did the same and got the kids lemonade to drink. The menu is more than just BBQ although it’s the BBQ that always gets talked about when someone tells me about Charles and Darl’s. I passed on a burger and ordered the Texas Brisket Sandwich. 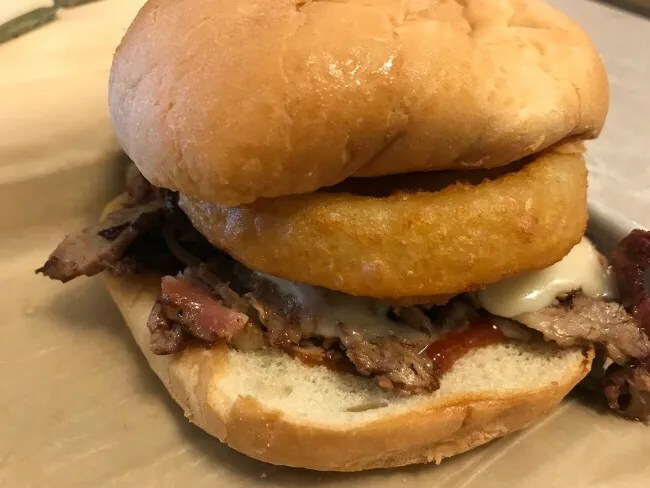 This sandwich is certified angus brisket, orange chiptole BBQ sauce, aged white cheddar, and a fried onion ring on a bun. The bulk of this sandwich was the onion ring. I pulled that off and the sandwich looked pretty small. There wasn’t a lot of meat but what was there was tender, smokey, and tasty. There was just a little bit of BBQ sauce underneath the meat on the bun and the whole thing was held together by the cheese which melted in between the individual pieces of meat so you got a little bit in every bite. The sandwich came with french fries. These were interesting. 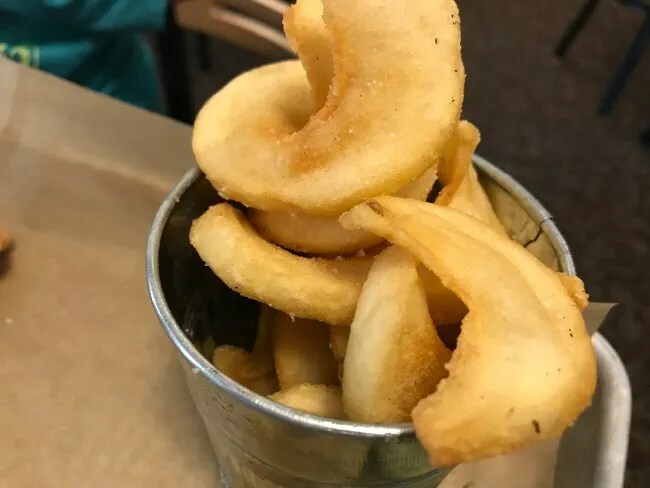 Again, there wasn’t a lot there, but they large, flat curly fries. They don’t appear to be made in house, but I have never seen this before. They are crispy on the outside and fluffy in the middle. They were interesting and very filling. J went a little more wild than I did when it came to ordering. 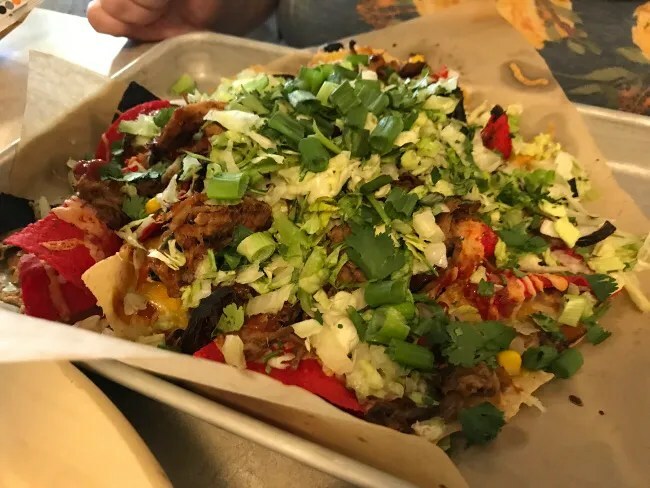 She got the Loaded Nachos off the appetizer menu. The plate is filled with corn tortillas, a black bean & corn salsa, scallions, lettice, smoked pork, and a drizzle of BBQ sauce. The plate was pretty large, but there was an even distribution of chips to meat on her plate. She really liked her choice. She got a large portion of the pulled pork and a lot of crispy tortilla chips to eat it with. We weren’t given a menu for the kids but the waitress said they usually do chicken strips, hot dogs, or smaller BBQ sandwiches for the kids. 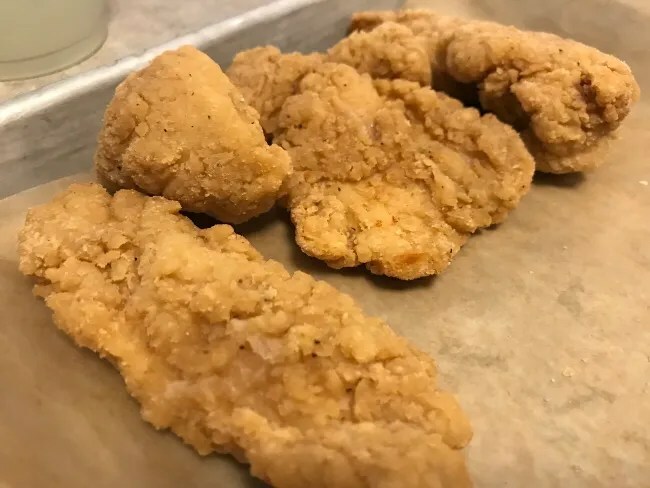 We got one plate of chicken strips to share between the two. The chicken is out of a bag and fried, but the kids actually polished most of it off. B’s thing right now is to just use chicken or french fries to get ketchup in his mouth but he ate a couple strips and a handful of the fries. L ate two and a half of the strips as well so we’ll count that as a win.